Nintendo has released System Software version 7.0 for Nintendo 3DS, which includes Miiverse support in addition to several other features. Notably, the system update allows users to link a Nintendo Network ID they've already established on Wii U, or create a new Nintendo Network ID. 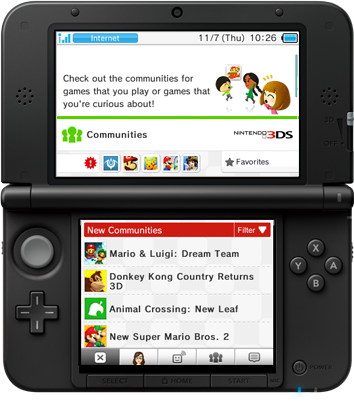 This functionality allows players with Wii U and 3DS to share a common wallet across the eShop on both systems. I wonder if any other older games will get a community. I'd like to see Mario Tennis get one, maybe it would help me play more online. Has anyone tried adding a friend through Miiverse yet? I don't believe you can. I only see the option to follow people but not add as a friend. I posted a few things on the service, and followed ludist210. That's all I've done so far. Seems okay. I thought this might be a separate app, but it's actually built-in to the system itself. You can suspend your game and check on Miiverse, like you can with the web browser. I was kind of surprised by that. That's annoying. Can you message people at all? Nope, no messaging at all. I guess that's kinda unfortunate but since even the Wii U doesn't have a proper notification system, I doubt the 3DS would have had one. At best, the blue link would blink... but then you have to load up Miiverse and check WHY it's blinking. Maybe we'll get it in a future update anyway? There was a part of the sign-up process that noted that you can't post directly to friends "at this time" - which leads me to believe that user-to-user messaging will be available in the future. Wow, then I'm much less excited about this update. Sure, the blinking blue light wouldn't be great, but at least you could send a message to an online friend who might actually read it and get back to you promptly. God, why can't Nintendo give us real communication? At this point, I'm assuming that ship has sailed for the 3DS and I'm going to treat it basically as a single player device. Well going by what @GameDadGrant said above, the future is hopeful at least! Nice summary, Roy. I would add that when you link your NNID to your 3DS, that should merge your eShop balances on the Wii U and 3DS shops. Managed to get the main update just fine, but I can't update StreetPass Plaza or access the eShop. I get messages that supposedly indicate trouble connecting the 3DS to an access point, but Miiverse and other internet stuff works fine. Does anyone else have the same problem? I had that same issue with the main update but power cycling my router fixed it. Yea, I guess functionality could be incrementally added. Not gonna get my hopes up, particularly after the Swapnote thing. Can't use eShop at all now. I wonder if the maintenance is still on-going? Or if Nintendo's servers are just too heavy with traffic right now. Maybe a mixture of both, with technical difficulties thrown in according to the network status page. At this point I'm starting to think it's a server load problem, since the Street Pass update still doesn't work, and nothing I try on my end seems to help. Thanks for the input btw, guys! EDIT: D'oh, posted before I saw the post above. Is there supposed to be a StreetPass update? I think it's just giving the same error for anything trying to download off of the servers since it can't properly check for an update. I got a notification about an available update for StreetPass Mii Plaza today (version 3.3, and I've got 3.2), and there is a red exclamation point symbol on the Check for Updates icon and everything. Ah okay, never got that here yet. Hm, okay. Well, that makes sense when I think about it - there are a LOT of 3DS owners out there, and if they are all updating right now...yeah. Things are gonna get messy. Thanks for the link!